which is also the President's Challenge for May. Reminder: May 5th demonstration is on for this coming Saturday the 5th of May. Symposium volunteer lists are up online: Link Signup now or soon. More below. If you intend to contribute the candy dish for Facebook use, then bring to the May meeting. June program will be a discussion on sanding and finishing. Details to follow. The President's challenge for June will be something turned not of wood. Will put up online galleries for members if requested. Email me some pics of your work, and I can put it online. I have not had any requests yet. The location is at Johnson's shop, San Jose. 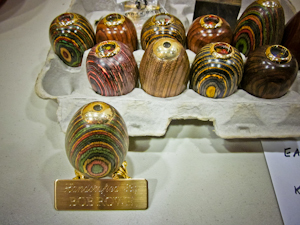 The meeting was a talk given by Guy Michael on non-wood turning, namely what he does to turn alabaster combined with a segmented ring. See picture below. He has a good display of his work on his website. The process of turning alabaster is not easy. He works hard to make the rock as round as possible. The rock turns slowly both in turning rpms and generates a lot of dust. Having a reduced speed controller and a fortified floor, weighted down lathe, he still can make the lathe dance. 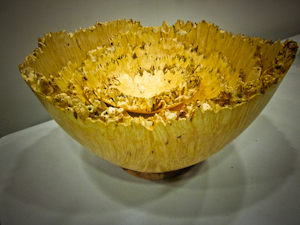 His work combines wood typically as a ring of segmented exotic wood. He uses epoxy resin and sands as one might do for a wood piece, going from 80 grit to 12K. His finished pieces are quite nice. 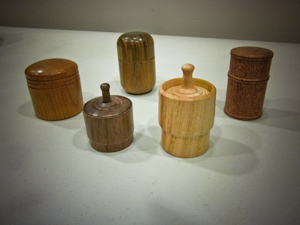 Was supposed to be fluted or spiral turning, but yours truly messed up, so there were a lot of lidded boxes. 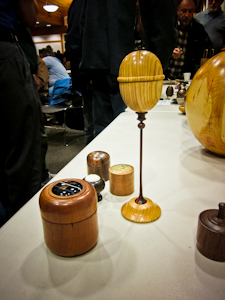 Tom Haines had a lignum vitae box, along with a hallow form made from Yew wood. Glenn had a lace wood box, and Phillip came through as well. Harvey Klein had a most unusual lidded box on top of thin neck, as shown at right. Starry displayed a cedar bowl and a cherry box. Badges were the optional challenge, with one having a segmented construction. 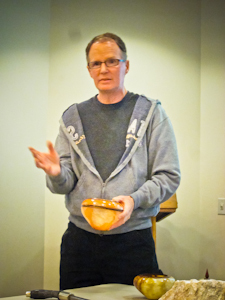 With Phil showing us a Manzanita natural edge bowl. Someone had a large selection of eggs with kaleidoscope inserts. 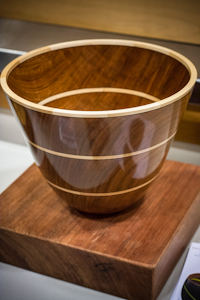 Curtis had a small bowl that began as a large bowl, made from Bay Laurel, shown at right. 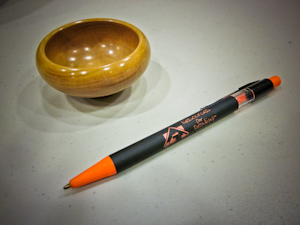 Don Jensen had a dyed bowl, dye diluted with acetone and colored an orange and yellow. 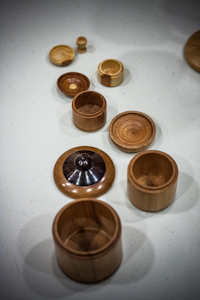 Dave Vannier had a nested bowl set, cored using the One Way system, and done from the outside in, meaning he chucked it with each outer bowl. This nice maple burl piece had 5 separate natural edge bowls. The finish was Linseed oil. 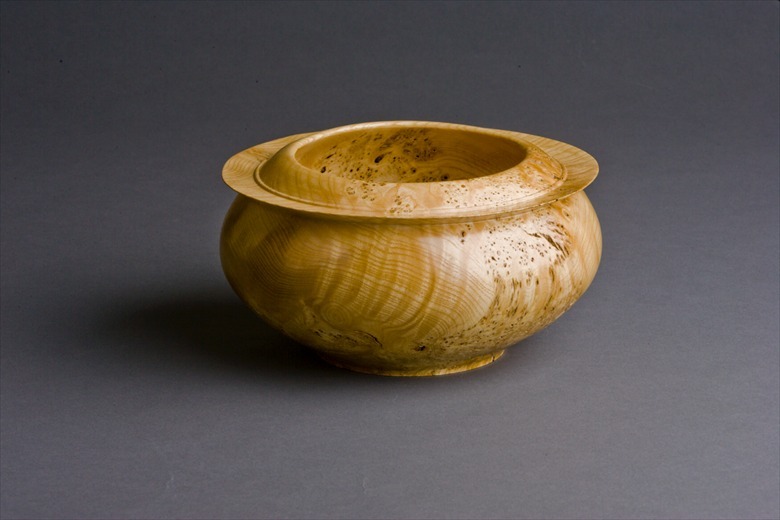 Ed Howes had a Manzanita natural edge bowl. Claude displayed a Snake wood something, sorry Claude, the staff (Me) let me down. Lonnie had display of work ranging from cutlery to a lamp to pens. He informed us that soaking the antlers in CA glue will harden the core. Nice range of work. The list of volunteer jobs are now up online: Link Do check it out soon and pick something. You do need to pay the registration if you want to attend the symposium. Most volunteer jobs do not require that you be registered. The slots for volunteering, include times outside of the program time as well as during, ranging from Tues through Sunday. Early June, only 5 weeks away, we will have the annual AAW Symposium in San Jose. A good percentage of club members are members of the AAW and have been to this symposium. Entrance fees are due by the middle of May, after which the price goes up. The instant gallery is open to the public. 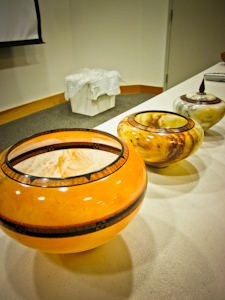 For the highlights of the 2011 Symposium, see this Link and checkout the lineup for demonstrations. This area will be used for lists and some communication. Assume that Yahoo groups will continue for email. The intention is that all other files will be on this website. I have placed a comment section there and can add other pages on specific topics that members can add comments to. Eric of Woodcraft informed us that Facebook will soon have a woodturning shop. They are requesting some dishes for candy to be contributed. Bring to the May meeting. It is preferred to be about 9in in diameter. San Mateo Library is offering some display space, which direct sales to customers. Display cases are available in September. George Lutz delivered the first classes for the club with 16 participants. He also has a good idea of what the club wants. Great news that we can figure this out. May 19th was the date for the next class, but this was postponed because of a conflict with the AAW Symposium. Jim Laflin informed the club that he will bring various tools to the May meeting for sale. It is from a woodturner who passed away, so be prepared to spend some cash to also assist the family. Laura spoke about the demos by Jimmy Clewes (rescheduled for the Fall). There is also a possibility of having Joey Richardson after the symposium in June. More to follow. The new website is receiving some corrections and further edits. You can find old newsletters now and even tutorials on various topics.